Shimizu Corporation is developing plans to install a belt of solar cells around the equator of the Moon to beam energy via safe microwaves and lasers to Earth. A 2035 construction start date would mark 50 years the company has been planning this. To ensure continuous generation of power, an array of solar cells will extend like a belt along the entire 11,000km lunar equator. This belt will grow in width from a few kilometers to 400km. 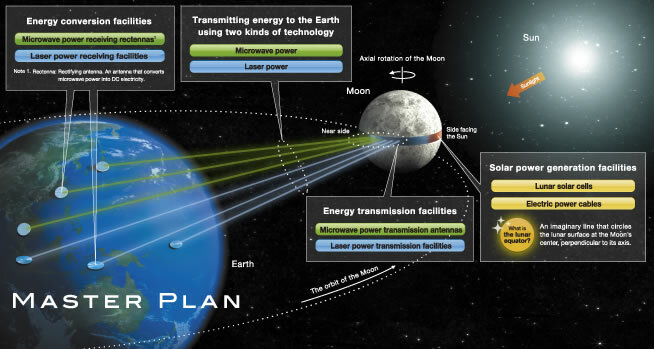 The cables will transfer the electric power from the lunar solar cells to the transmission facilities. The 20km-diameter antennas will transmit power to the receiving rectennas. A guidance beacon (radio beacon) brought from the Earth will be used to ensure accurate transmission. High-energy-density laser will be beamed to the receiving facilities. A guidance beacon (radio beacon) brought from the Earth will be used to ensure accurate transmission. Materials needed for the construction and maintenance of the Solar Belt will be transported along this route. Electric power cables will be installed under the transportation route. 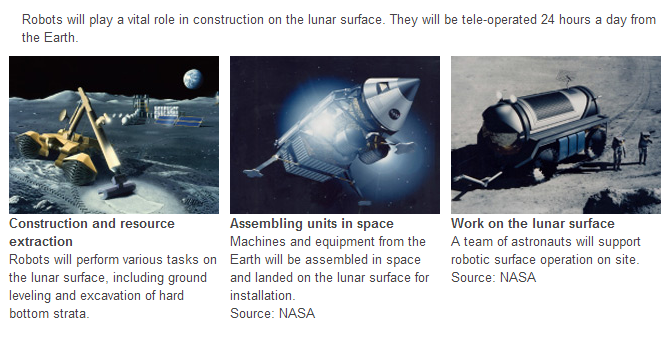 Lunar resources will be used to the fullest extent possible in constructing the Solar Belt. Water can be produced by reducing lunar soil with hydrogen that is imported from the Earth. Cementing material can also be extracted from lunar resources. These materials will be mixed with lunar soil and gravel to make concrete. Bricks, glass fibers and other structural materials can also be produced by solar-heat treatments.